Once upon a time, I made a fantastic batch of fudge. It was so good, I made it again and again and never tried any other recipe or budged from exactly what was written. Now, four years later, I'm branching out. Instead of adding mint extract and crushed peppermint candies, I decided to satisfy my cinnamon cravings and toss in some red hots, or as they're known in more sophisticated circles, cinnamon imperials. That's right--those little candies are good for more than just making terrific baked apples, applesauce, or apple pie. While they were tasty in this fudge, I made the mistake of adding them in their unbusted form. In doing this, they remained quite hard until the fats softened them up and also didn't impart much cinnamon flavor. The trick, as I discovered, is to crush them pretty finely; that way, your teeth don't get broken and your mouthful of fudge gives you a nice cinnamon kick. If I'm being honest, the mint fudge is still my favorite, but this is a pretty awesome alternative. Line an 8-inch square pan with wax paper. Melt the vanilla chips and frosting in the microwave, stirring until smooth. Mix in the vanilla extract and chopped red hots. Spread the creamy goodness into the prepared pan. Drip the food coloring over the fudge and swirl decoratively with a knife, if desired. Chill until set. A wonderful treat! Extremely addictive, I'm sure. The cinnamon touch must have made it extremely aromatic! 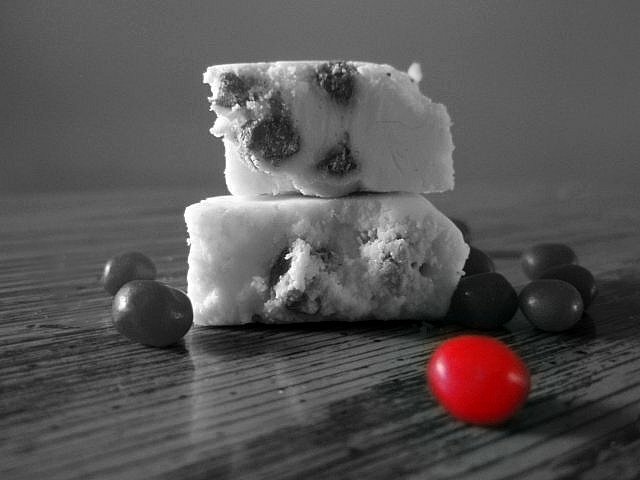 I have never met a fudge that I didn't like. My daughter loves these things. Mmmm... and perfect for valentines day! Grace you are the only blogger who's photos of food make me grin from ear to ear. Somehow you're able capture a personality in inanimate objects that just cracks me up! This is perfect for the Valentine's Day. Love having a standby fudge recipe. Mine includes condensed milk. This one sounds worth a try! I love the idea of a cinnamon fudge! The red peeking through is too cute! I am a dismal failure at fudge. It never hardens up and I'm not sure what I do wrong, but apparently I do it wrong every time. I adore red hots! I have never heard of them being incorporated into a fudge before, but it is absolute genius. The creaminess with the spiciness sounds completely perfect! Being a cinnamon lover, I know this fudge would make me a very happy lady. 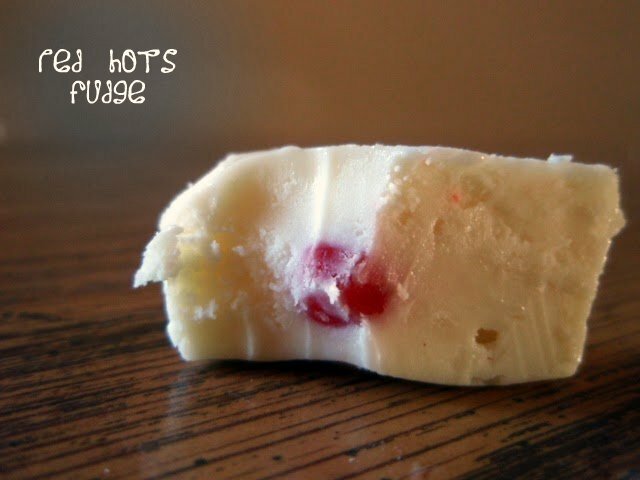 Red Hots Fudge is such a fabulous idea. Love it! What a great idea. A perfect treat for my little valentines. What a great idea for the Red Hots! :D It's been years since I had them but I can remember their spicy flavour vividly! LOL I think that's the case with most people who make fudge. I always hear that once they find THE perfect recipe, they stick to it. Fudge can seem easy. But it's a challenge to get just the right consistency. Yours looks divine. oh my goodness. this looks delicious. honestly thinking about making some for Valentines day! I'm crazy for red hots! I can't keep them in the house, I eat them all. Can understand why you'd have to crush them a bit...great idea to try them in fudge. It sounds simple to make and looks absolutely delicious,Grace! This sounds like a fun fudge for Valentine's Day! The pretty red and white together would drawn me in immediately.